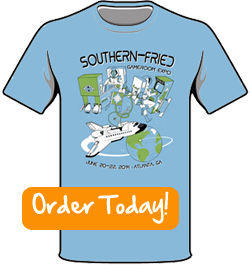 Houston, We (still) Have T-Shirts Available! Have you heard the word? Our SFGE t-shirts are now available! Famed artist Jon Chad was commissioned to create a custom design for our inaugural show. The artwork features a Space Shuttle theme in honor of our guest Barry Oursler, and the 30 year anniversary of the milestone game. If you look closely, you may even recognize the astronaut. If you pre-order the shirt today, you can save $5 off the regular price! Get them before they’re gone!